This morning I ran 4.15 miles (415 is our area code -- very clever!) 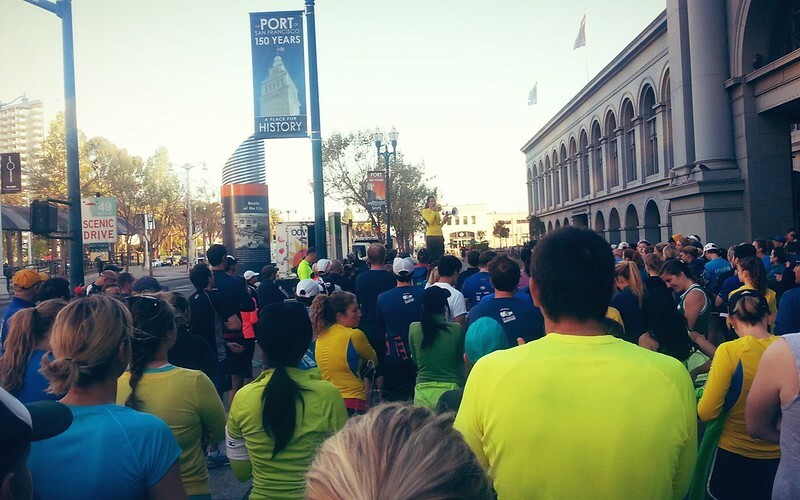 as part of an SF Marathon-organized solidarity run for Boston. Everything about it was beautiful, except perhaps my energy level (5 hours of sleep, no coffee and no breakfast beforehand). We were all encouraged to wear Boston Marathon colors, blue and yellow, though as you can even see in the image above, quite a few wore their actual real Boston Marathon shirts ... and that made it even MORE meaningful. It was so incredible to be there with so many others at 7am on the Friday of this week, this ridiculously depressing week, and run while watching the sun rise over the bay. It felt beyond hopeful. It felt ecstatic. And that feeling is something I know every person who ran this morning is trying to hold onto -- that feeling of good in the world. It's right here. I will talk more about this in another post, but I am so grateful for the running community. I've yet to meet a fellow runner who isn't kind, generous and accepting, and that both stands out and means a lot. Happy Friday and happy weekend, world. Let's make it a good one.